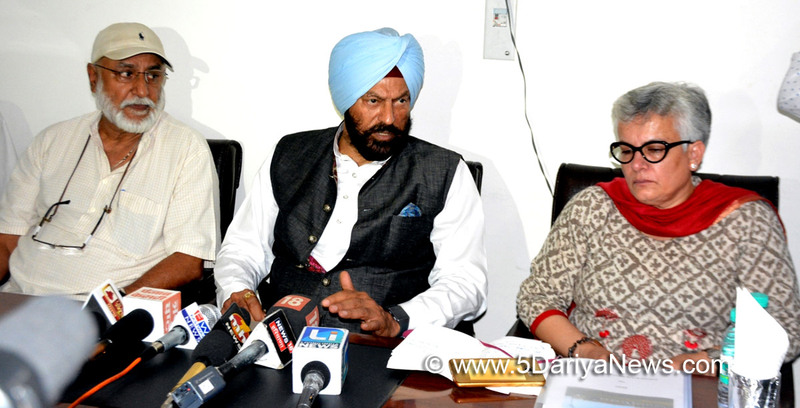 The Sports Minister, Punjab, Rana Gurmit Singh Sodhi today took stock of the sports facilities at 2 sports stadiums in sector-78 and sector-63 and the Punjab Institute of Sports (PIS). During the visit to sector-78 stadium the minister met all the District Sports Officers (DSOs) and coaches. He also said that for ensuring better results and creating congenial atmosphere besides honouring the players, the sports budget of Punjab would be increased. He further said that sports are top priority with the Chief Minister Captain Amarinder Singh and that is why the first sports university of Punjab is coming up at Patiala.Rana Gurmit Singh Sodhi while addressing the sports department officers and coaches said that,"Today I am interacting with you not as a Sports Minister but as a player. So, I have utmost respect for you as well as expectations because I have resolved to restore Punjab to numero uno position in the country." Exhorting the coaches to show better results, the minister while making a special announcement said that the Punjab Government on the pattern of Dronacharya Awards would honour the coaches showing exceptional results with the special award and with cash awards too on the pattern similar to players. He also announced to send coaches to foreign countries for learning latest techniques.Rana Sodhi instructed the District Sports Officers (DSOs) to send monthly progress reports of the coaches in writing. He further said that the coaches should identify excellent players from amongst the lot training under them who would be prepared for the international level competitions. Adding more, he said that the first test of our coaches would be the National Games at Goa and the Asian Games at Jakarta where they would be expected to make Punjab players win maximum medals. He also inspired the coaches to make the players work harder in order to win more medals in Olympic, Asian and Commonwealth Games. Cautioning those with poor results, the minister said that poor performance won't be tolerated and if anybody needs any type of facility then he/she can come to him anytime. The minister also took stock of the all facilities at the 2 sports stadiums and saw the Gymnastics, Table Tennis, Swimming, Basketball, Wrestling, Judo and Hockey grounds. Taking serious notice of the discrepancies in the construction of stadium and gymnasium hall as well as the bathrooms, Rana Sodhi instructed the officers concerned to rectify the shortcomings at the earliest. He also took serious note of the bad condition of the swimming pool and breakage of tiles on the walls and while directing the officials to rectify the faults, said that the sports structure inside the stadium would be made better because good results in sports always come with good infrastructure. Interacting with the media-persons, the minister said that the previous regime did not consult technical experts with regard to the sports stadiums but the present government would make good these shortcomings in consultation with experts and make available a par excellence structure needed for sports.He further said that in order to attract the young children towards the sports from the young age, he would meet the Education Minister for better co-ordination between the sports and education department and furthermore the physical education teachers would be given coaching by the department. While visiting the hockey Astroturf, Rana Sodhi directed the officers to ensure that the chairs meant for the spectators should be properly maintained. He was also apprised of the sports facilities by the coaches of all the other sports present there. The minister said that the Punjab Government would ensure arrangement of sports coaches, facilities, diet and necessary paraphernalia for the players so as to produce world class players and also said that no talent would be allowed to go waste.Rana Sodhi further added that there would be no bias in the selection for any tournament and every selection would be merit based and transparent. He also said that he would personally tour all the sports stadiums of Punjab and know the ground realities. He also asked all to follow the slogan of 'KHELO PUNJAB.. NO TO DRUGS, YES TO SPORTS'.On the occasion, Director Sports Mrs. Amrit Kaur Gill welcomed the Sports Minister and introduced him to the departmental officers as well as the coaches. Others present included Director (Technical) Punjab Institute of Sports (PIS) Mr. Sukhbir Singh Grewal, Director (Administration) Mr. R.S. Singh Sodhi, Assistant Director Sports Department Mr. Kartar Singh Sembi, Deputy Director Mr. Surjit Singh, Joint Secretary Punjab Sports Council Engineer Sanjay Mahajan and DCFA Mr. Pawan Kapoor. The Sports Minister Rana Gurmit Singh Sodhi also visited the spots to have a look at the boarding and lodging as well as the mess facilities. The minister also partook the food in the mess and expressed satisfaction at its quality. He also visited the hall where the hockey players of the Punjab Institute of Sports live and said in his interaction with the media that the places housing the players must be top grade. He also said that in the coming 2-3 months hostel would be ready where these players would be lodged.